Important scientific information has been emerging from research at Quelccaya Ice Cap for nearly 50 years, from ice core records, glacial geology studies, and meteorological measurements. In recent years, research has also yielded new biological findings, revealing the importance of glaciers to the lives of birds in the High Andes. We published a paper in 2008 documenting nesting on glacier ice at Quelccaya by White-winged Diuca-Finches. Diucas are a medium-size tanager species found in the High Andes of Peru, Bolivia, and Chile, and prior to our new publication were the only bird known to routinely build nests directly on glacier ice. This species is also among the highest-elevation nesting species in the world – to at least 5400 meters (18,000 feet) – despite an environment with average temperatures below freezing, high winds, frequent snowfall, and intense solar radiation. Our paper in the latest Wilson Journal of Ornithology provides new details on this unique behavior. Ten years of additional observations include fieldwork at Quelccaya outside the core dry season, culminating in 2 weeks at the glacier in 2016 filming a Diuca nest with 2 chicks. Besides observations of multiple active nests, the paper also documents glacier nesting by another species, the White-fronted Ground-Tyrant, and describes nocturnal roosting within or under a glacier by 5 different species. The publication includes an online Supplement (also available here) containing additional images, and links to the BBC/PBS film. Nesting and roosting on glaciers are adaptations to the harsh environment at high elevations in the Andes, as cavities within the ice provide both a protected microclimate and protection from predators. Are glaciers important to other species, elsewhere? What happens when the glaciers are gone, victims of climate change? Andean glaciers are shrinking rapidly, and even the largest are likely to disappear this century. 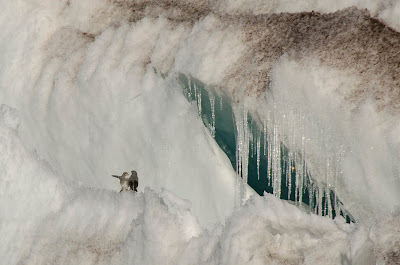 Although undocumented until only 10 years ago, the lives of several bird species appear to be dependent upon these glaciers. Their loss may have a direct, negative effect on biodiversity of the High Andes - in addition to other impacts, such as water resources.